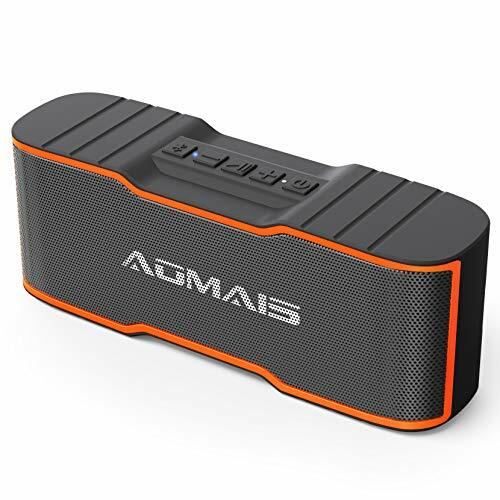 AOMAIS Sport Portable Bluetooth Speaker!! GO NOW!! Compact and Portable: Ultra-portable Bluetooth speaker delivers 10W powerful sound and rich bass through two drivers and a passive subwoofer,speaker with rope perfect for travel & hiking, easy to fit in your bag or backpack. Long Playtime: Built-in high-capacity rechargeable battery up to 10 hours playtime at 50% volume on a full charge, playtime varies according to volume level and audio content. Bluetooth 4.2 Technology: Connect via Bluetooth in seconds to iPhone, iPad, iPod, Smartphones, Laptops, Tablets up to 99 feet. Play with TV and non-Bluetooth devices use the 3.5mm audio cable. Built-in Mic for hands-free speakerphone. IPX4 Water-resistant: Splashproof, rainproof, dustproof, sandproof, snowproof shockproof, perfect for beach, shower, pool, boat, golf cart, home or yard party. IPX4 rating water resistant speaker cannot be partially or fully submerged. Wireless Stereo Sound: Pairing 2 Sport II MINI for loud stereo sound via a single device. For better listening experience, please put the speakers within 99 feet each other of indoors use. ❤❤❤(Note: Each AOMAIS Sport II MINI is sold individually.Can not stereo pairing with AOMAIS Sport II and AOMAIS Sport II+)❤❤❤ .